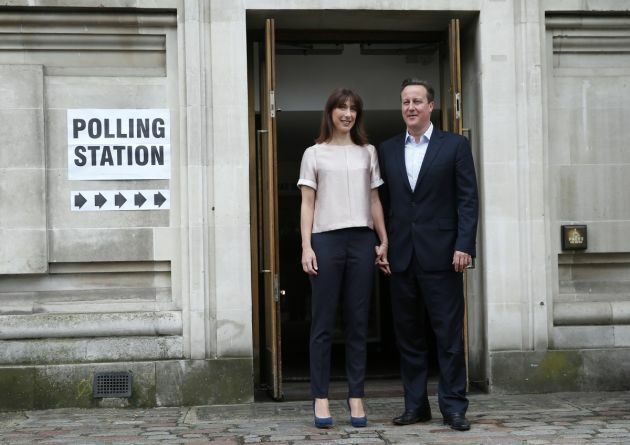 (Photo: REUTERS / Suzanne Plunkett)Britain's Prime Minister David Cameron and his wife Samantha leave after voting in the local council and European elections, at a polling station in London May 22, 2014. Voters in the United Kingdom and the Netherlands have gone to the polls for the next European Parliament with churches issuing EU voters with one common message: please vote. Another common message from churches is to vote in way that enables tolerance for migrants and newcomers to their countries which will hold polls over the next four days. That is something that is not being heeded by the anti-immigrant United Kingdom Independence Party (UKIP) and other anti-EU parties throughout Europe expected to make gains in the European Parliament elections. UKIP is likely to top European elections or come a close second in Britain, opinion polls suggest despite a torrent of criticism accusing it of bigotry and racial slurs that have failed to deter voters. Euronews cited a poll putting Nigel Farage and his anti-immigration, anti-Europe stance ahead of Britain's Labour and the Conservatives parties 27 percent of the vote. The European election is expected to see surging support for populist parties and pose a serious challenge to mainstream politicians in the European parliament, The Financial Times reported. The newspaper reported Europe's center-right parties were forecast to emerge as the biggest group in the European parliament, followed by center-left moderate left and liberal, according to the latest polls. The Catholic Bishops of EU countries published the most comprehensive statement ahead of the poll reaffirming their support for the "European project" and encourage all citizens to go to the polling booths, Indepedent Catholic News reported. "It is the right and duty of every EU citizen to cast his or her vote. "Many millions of young citizens will be voting for the first time, some still in education, others in the labor market, but many, alas, unemployed. We urge our young people to make their voices heard by engaging in the political debate and, above all, by voting," said the bishops. The bishops said it is important that seeking to enter the European Parliament are aware of "the collateral damage of the banking and economic crises" triggered in 2008. "The numbers of 'new poor' are growing at an alarming rate," noted the Catholic leaders. "A culture of restraint must shape the social-market economy and environment policy. We must learn to live with less, but by the same token see that those in real poverty get a fairer share." The governing board of the Conference of European Churches, a grouping of mainly Anglican, Lutheran, Orthodox and Protestant churches has said it envisions, "Europe as a place of peace, solidarity and cooperation. "CEC invites its member churches to stand up actively against extremist positions that are contrary to basic standards of humanity and that deny values on which the European tradition has been built and that stand against basic principles of Christian ethics and faith." CEC ran a pamphlet campaign before the polls encouraging its members to debate about the EU. The pamphlet acknowledge Europe faces problems saying, however, "The elections present chances to make contributions to overcoming extremism, renewal of solidarity, respect of differences and sharing responsibility." In Britain the Baptist Union of Great Britain, the Methodist Church in Britain and the United Reformed Church released an election briefing that explains why the EU elections are important. In it they note that elections for the EU Parliament have tended to draw a low voter turnout in the UK. Only one third of voters participated in the 2009 European elections, compared to two thirds who voted in the 2010 UK national election. "The EU plays a strong role in promoting a culture of human rights, particularly in former communist countries and further afield. "The Charter of Fundamental Rights, working alongside the European Parliament's Human Rights sub-committee, covers a wide range of areas, from gender equality and the rights of children to workers' rights and education, and it helps to further human rights and give a voice to those whose rights are infringed around the world. "Last year the EU adopted new guidelines on protecting freedom of religion and belief, and continues to promote equality for all," the UK churches said. Some 382 million people cast their votes on different days; in Britain and the Netherlands on May 22; in Ireland and the Czech Republic (over two days) on May 23; on May 24 it is notably Latvia, Malta and Slovakia's turn. The remaining 21 countries vote Sunday, May 25. The results will be declared Sunday.